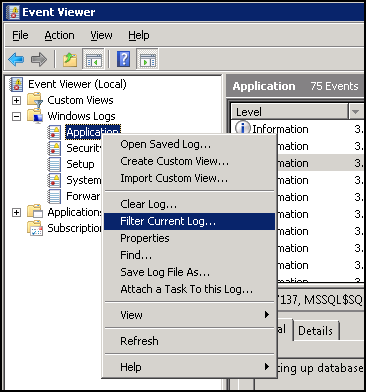 SQL Server service account information is stored in Windows Registry database. You can get this information from Services Console or SQL Server Configuration Manager. We can use same registry for default and named instances as xp_instance_regread returns instance specific registry. 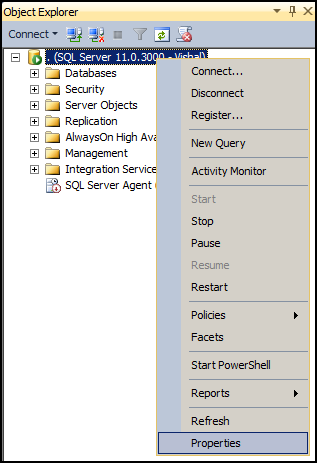 This is a follow-up post on SQL Server – Check SQL Agent Job History using T-SQL. SQL Server Agent stores SQL jobs history in sysjobhistory. It has two different columns for date and time, Run_Date and Run_Time. Since this is not available as DATETIME we cannot filter based on certain criteria such as jobs that run in last 24 hours. 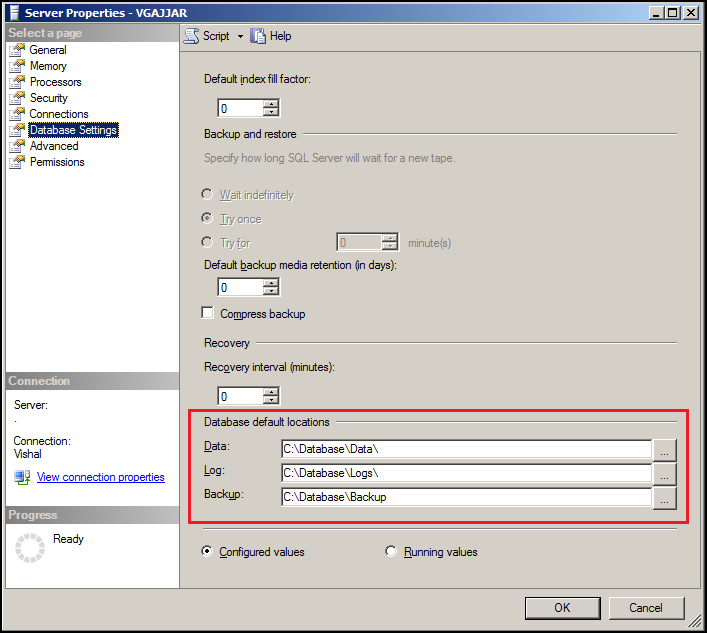 To identify default data and log directories in SQL Server 2012 you can use SERVERPROPERTY() function. In SQL Server 2012 two new parameters are added to SERVERPROPERTY() function namely, InstanceDefaultDataPath and InstanceDefaultLogPath which returns the default data and log directories respectively. You can also get this information from Server Properties dialog box in SQL Server Management Studio. To identify this information for earlier version of SQL Server you need to use xp_instance_regread extended stored procedure which returns data from registry. Earlier I posted on identifying default data directory for multiple instances through registry which returns this information for all instances installed on server. By default SQL Server listens on TCP port number 1433, and for named instances TCP port is dynamically configured. There are several options available to get the listening port for SQL Server Instance. Here are a few methods which we can use to get this information. Step 4. 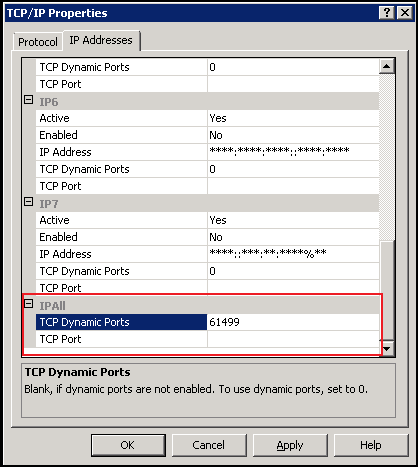 In TCP/IP Properties dialog box, go to IP Addresses tab and scroll down to IPAll group. If SQL Server if configured to run on a static port it will be available in TCP Port textbox, and if it is configured on dynamic port then current port will be available in TCP Dynamic Ports textbox. Here my instance is listening on port number 61499. When SQL Server is started it logs an event message as 'Server is listening on [ 'any' <ipv4> <port number>' in windows event logs. Here <port number> will be actual port number on which SQL Server is listening. Step 1. 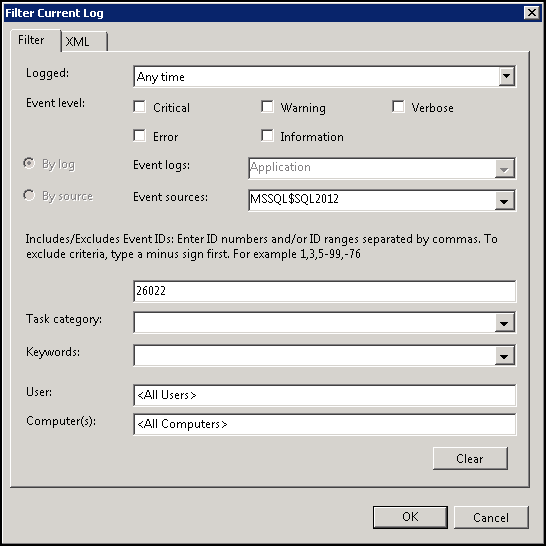 Click Start > Administrative Tools > Event Viewer. Step 4. You can filter the events by Event ID and Event source. 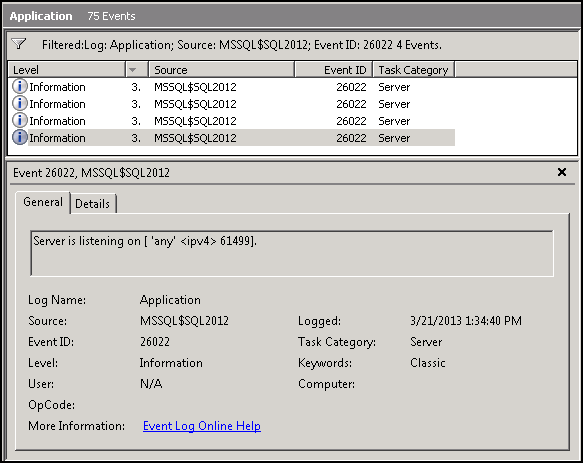 The event we are interested in has Event ID of 26022, and it’s source is SQL Server Instance. You need to filter by both Event ID and SQL Server Instance if you have multiple instances installed, for a single instance you can filter by Event ID only. Click on OK to apply the filter. Step 5. Once the filter is applied, Locate message 'Server is listening on [ 'any' <ipv4> …'. As we can see from below screenshot that SQL Server Instance is running on TCP Port 61499. 2013-03-21 13:34:40.610 spid18s Server is listening on [ ‘any’ <ipv4> 61499]. 2013-03-21 13:34:40.610 spid18s Server is listening on [ ‘any’ <ipv6> 61499]. As we can see from the output that SQL Server Instance is listening on 61499. Note: This method does not work if SQL Server Error Logs have been cycled. See sp_Cycle_ErrorLog for more information. Port number can also be retrieved from Windows Registry database. Note: The above code will only work if SQL Server is configured to use dynamic port number. If SQL Server is configured on a static port, we need to use @value_name = 'TcpPort' as opposed to @value_name = 'TcpDynamicPorts'. There are different options available when you want to execute a .sql script file on a server. You can open the script file in SQL Server Management Studio and execute it, or you can use SQLCMD to execute a script from command line. However, when you have large number of scripts to execute these methods may not be feasible. You can use SQLCMD and batch programming together to execute a large number of script files easily. Copy this to notepad and save it as a .cmd or .bat file, for example save it as "RunMyScripts.cmd" in the same folder where your scripts are stored. Make sure you replace server details and authentication details. When you create a new database in SQL Server without explicitly specifying database file locations, SQL Server created files in default location. 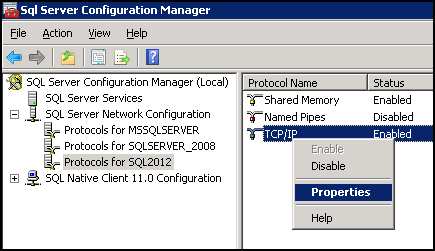 This default location is configured when installing SQL Server. If you need to change this default location once SQL Server is installed, you can change this in server properties. Step 1. Right Click on Server and Select "Properties". Step 2. in the "Server Properties" dialog box, navigate to "Database Settings" tab and data/log files location under "Database default locations" group. You can also change default backup location here. Step 3. Click on "OK" to apply changes. All new databases will be created to new location unless specified explicitly. This is a personal weblog. The opinions expressed here are my own and not of my employer. For accuracy and official references refer to MSDN, Microsoft TechNet, Books Online. I or my employer do not endorse any of the tools / applications / books / concepts mentioned here on my blog. I have simply documented my personal experiences on this blog.